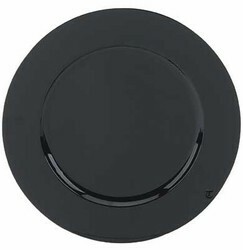 Home > Products > Tabletop Classics Round Acrylic Black Charger Plate 13"
Enhance your tabletop presentation with the Tabletop Classics Round Acrylic Black Charger Plate 13". Boasting a glossy black finish, this product beautifully frames dinnerware and easily complements any table decor. Suitable for weddings, upscale events, and fine dining establishments, this piece adds a contemporary yet elegant touch to your table arrangement. Made from high quality acrylic, this charger is lightweight and exceptionally durable. Combining style, longevity, and functionality, it not only complements high-end table settings but also protects against spills and mess. Hand wash this charger plate to keep it in excellent condition.